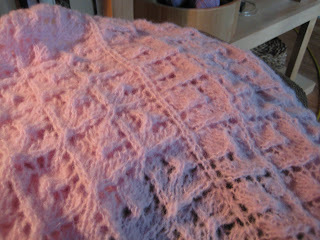 A couple of days ago I finished the lace shawl I've been working on for not too long. I caved in at 13 repeats instead of 15, but when I had done 14 of 16 rows of the lace border I was out of yarn, so I'm quite happy with my poor endurance. Look at how nicely it blocks! 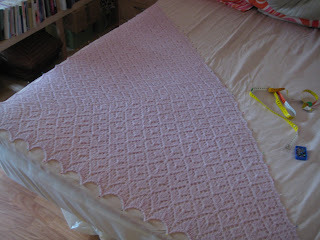 (I don't block - or knit - lace that often) It's almost 170 cm from corner to corner. Great stuff! Lessons learned: Not many. It was a simple knit with an interesting/clever beginning and a pattern that never bored me. I never at any time felt sick of this project! 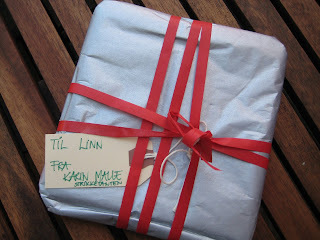 Yesterday I got my second SP parcel! It was kind of green/red colour themed - very coordinated. Look! 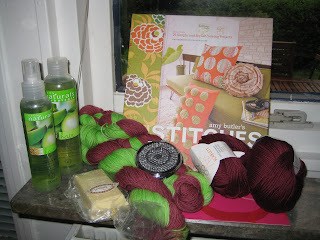 There were two balls of burgundy cotton, two hanks of sock yarn, possibly hand dyed and possible self-striping, more fruity shampoo and conditioner, more chocolate, a compact mirror, and best of all: a Amy Butler sewing book! 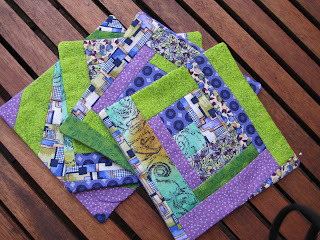 It's so good I can't believe it - I love her fabrics (check them out at purlsoho.com) and the designs are very elegant. Can't wait to make something from it! Thank you, dear SP, for all the nice things! And please tell me more about the sock yarn! Apart from that, I've done some yarn procurement lately. First of all, I got some Regia sock yarn from Garnkorgen - I thought it was just multicoloured, but it turns out to be rainbow striped. That works fine, since I'm going to knit socks for a gay friend... From the same shop I got two hanks of Lorna's Laces Shepherd's Sock in colourway "Tuscany" - very nice! This will be socks for a special someone, when I get the time... 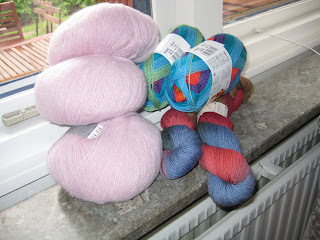 The third yarn in this pic is like heaven in my hands - Faerytale from Du Store Alpacka. It's pink and fuzzy, and I'm making a lace shawl to wear at a wedding in two weeks. Free pattern (in Swedish) available at Avigmaskan. I've been a blogger on holiday, even though I've been working for two weeks now, for too long. I thought I'd share my thoughts on what olympic sport my knitting resembles, until I find the strength to post pictures. I think some of my knitting can be compared to short distance running (socks, mittens), in some cases with hurdles (socks and mittens with lace and/or cables). Sometimes it's more long distance (sweaters, shawls). Sometimes it's more like wrestling (really tricky cables and not using a cable needle) and sometimes like canoeing, in the sense that I'm sitting still, working with my arms and everything runs smoothly and quickly forward.